This week sees the arrival of the new first years to the Creative Broadcast & Film Production programme at Limerick Institute of Technology. With the return of all the other students on Sept 10th, this year will see a huge increase in numbers. We look forward to greeting everyone and working with students on multiple academic and creative events such as the Richard Harris International Film Festival in October, the LIT Music Festival and the Student Showcase in spring 2019. For future students thinking of joining the programme in 2019 then watch this space for info on forthcoming open days at LIT and other Creative Technology Events. This March, LIT hosts its 7th annual Music Festival in partnership with SPIN South West. The week-long event consists of interactive workshops, exhibitions, music, and art installations. Along with talks from leading music and media industry professionals and special performances from our very own students as well as local talents. This year’s festival takes place from the 12th to the 15th of March 2018. Check back for more updates on LIT Music Festival 2018. Giving his unique insight to his work practices and his new album, Paddy Mulcahy entertained a large audience with both performances and samples of his work and talent. Paddy, a graduate of Music Tech Production at LIT, spoke about equipment, software and instruments to students, while also praising the support he got from staff during his years in college. 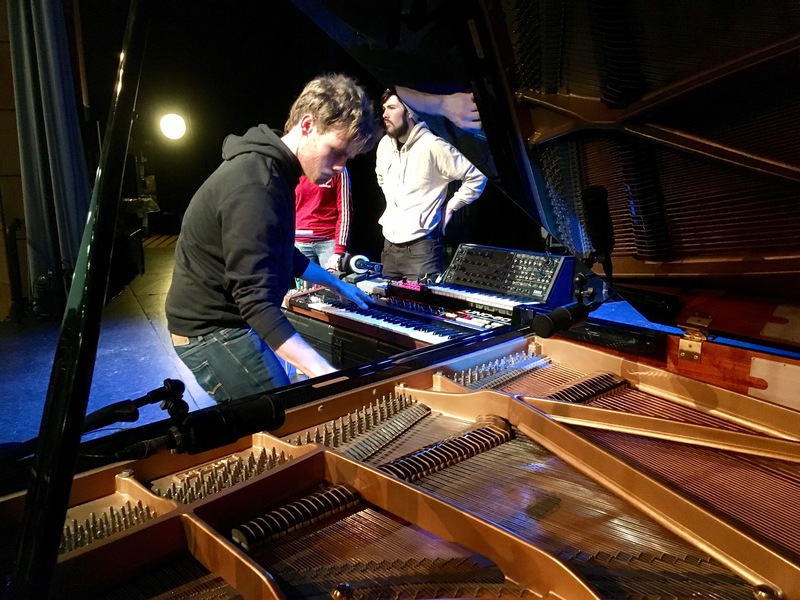 The LIT Music Festival continues today and finishes Thursday night with performances from the LIT house band which consisting of current Music Technology Students. Sister festival to the Limerick Film Festival, the LIT Music Festival, takes place next week. As its a special celebration and if you are in the Limerick Region next week to check out some of the great events. This year marks a very special milestone for Music Technology at LIT. Ten years. 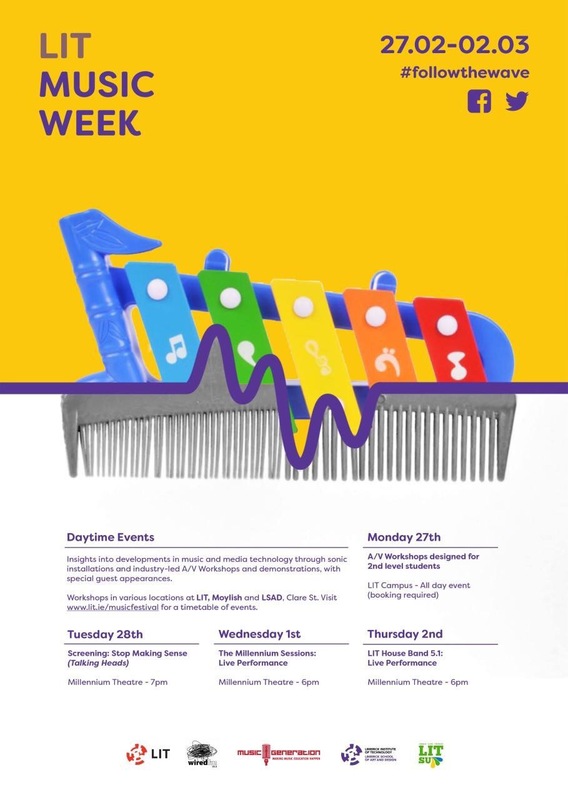 And as part of our celebration of the course going from strength to strength, this year’s music week, which is taking place from the 29th of February to the 4th of March shall be bigger and better than ever! 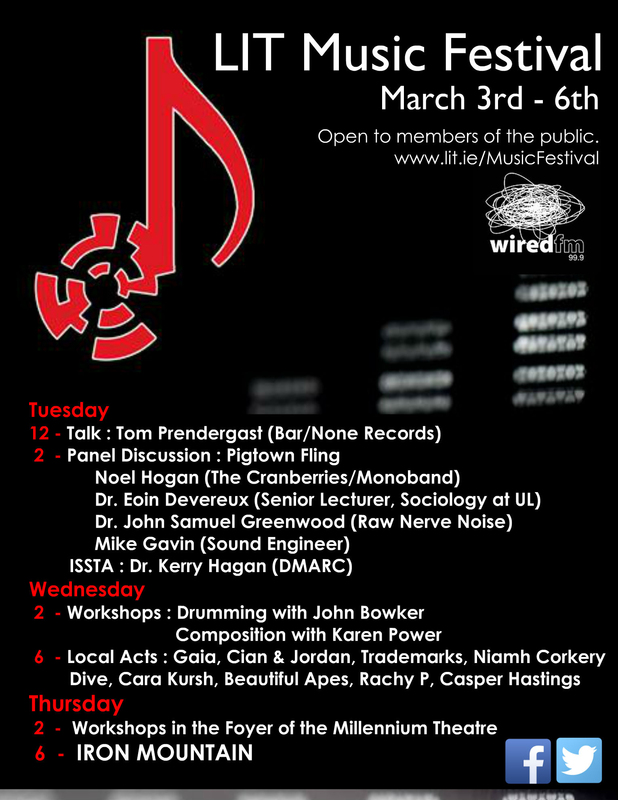 Music Week is an annual event held on the grounds of LIT, run by the students of the various years of the Music Tech course. 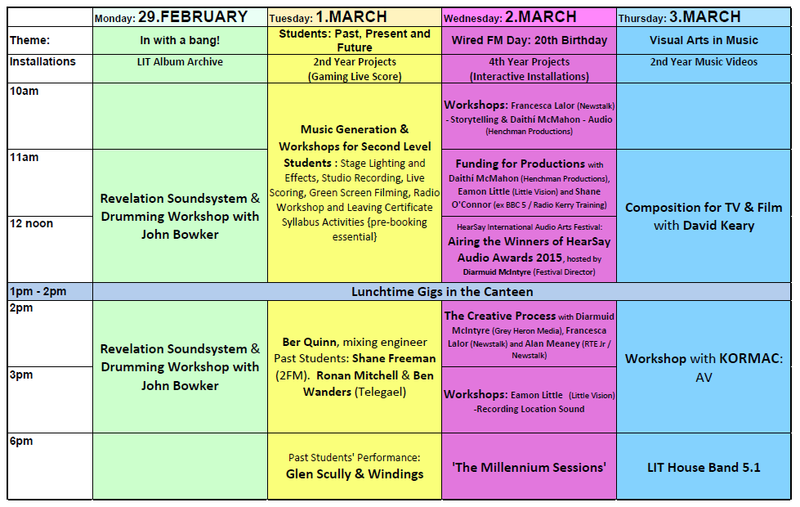 Just like previous years we are hosting a range of creatively inspiring workshops and performances throughout the week, this year including a performance from well-known Limerick band: Windings, and a special AV show from DJ Kormac. LIT Music Week is also a great opportunity for students hoping to study at LIT in the future. The events give great insight into some of the activities conducted by current LIT students. Having said that – These events are open to the public, all are welcome to come along and support local and national talents! LIT Music Festival Returns with a great lineup. Limerick institute of Technology is running the sister festival to the Limerick Film Festival from March 3rd to 6th 2015 at the Millennium Theatre. As you can see from the poster there is an impressive lineup and several events that are not to be missed.